The two bodyguards of Bengal BJP president Dilip Ghosh were today summoned to clarify why they hadn't accompanied him to the hills last week, when he was chased and heckled by some youths. "The two guards were called today to the special branch's headquarters. They told senior officials there that they did not go with him as he had asked them not to," said a police source. "There have been allegations that the youths dared to heckle Ghosh as he didn't have his armed guards around.... We wanted to know why they were not present," he said, adding that a detailed report on the incident was being prepared for Delhi. Ghosh is entitled to two armed bodyguards because of his status as an MLA and the state chief of a national political party. Asked why he did not take the guards with him, Ghosh said: "I have heard that my two bodyguards were questioned today.... But it was my decision not to involve them as I went there to take part in a socio-cultural exchange programme." Sources in Calcutta police said the choice of taking guards along lay on the person offered the security cover. "We have little option if the person concerned refuses to take the cover," said an officer. A senior official of the special branch, however, said the presence of the bodyguards would have hardly made any difference on October 5, when Ghosh was attacked and chased by over 100 youths. "On the contrary, things could have been worse had the armed guards been there and resorted to firing," the officer added. Ghosh and some of his supporters were chased and allegedly assaulted by the group of youths in Darjeeling on the second day of his three-day tour to the hills, prompting him and other BJP leaders to beat a hasty retreat and take refuge at a police station. Sources in the BJP confirmed that the central leadership had taken the incident seriously and national president Amit Shah's office had sought a report from the Bengal unit. 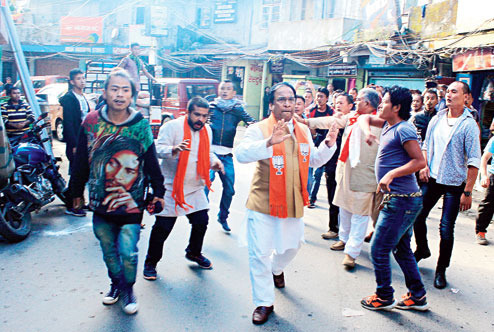 "Even the ministry of home affairs had sought a report from the Mamata Banerjee government over the attack on our state president," a state BJP functionary said. Immediately after Ghosh and his aides had taken refuge at the police station, the central government had deployed at least four CRPF jawans for his security in the hills.